Desmond Marrow was drafted by the Tampa Bay Buccanneers. The Georgia police officer, who was fired after violently wrestling former NFL player Desmond Marrow to the ground and then choking him, rejected a deal for lesser charges and will now head to trial, according to ajc.com. David Rose now faces felony charges and a jury trial after he rejected a plea deal Tuesday on a charge of simple battery for his role in the violent incident. A disturbing video went viral in April, showing Marrow lose consciousness as police officers violently wrestled him to the ground and choked him. In the video, you can hear Marrow say “I’m not even doing nothing! I’m not even fighting back!” His hands are handcuffed behind his back as two police officers slam him up against a truck and ultimately throw him to the ground head first. “Everything is on the table,” said Henry District Attorney Darius Pattillo, adding that Rose could now be hit with additional charge, including violation of oath of office, the ajc.com reports. It seems the former Henry officer is not bothered by the fact the he was was heard on dash cam video bragging about his moment with Marrow. Rose and his partner, Officer Matthew Donaldson, pulled over the athlete in December 2017 for reckless driving. “I’m not going to write it down, but hell ya I choked that (expletive),” Rose is heard telling Donaldson. Had Rose accepted the deal, he would have been required to surrender his Georgia Peace Officer Standards and Training credentials, effectively ended his law enforcement career, Patillo said. A felony charge against Marrow, a former defensive back who was cut by the Tampa Bay Buccaneers pre-season in 2012, was dropped. 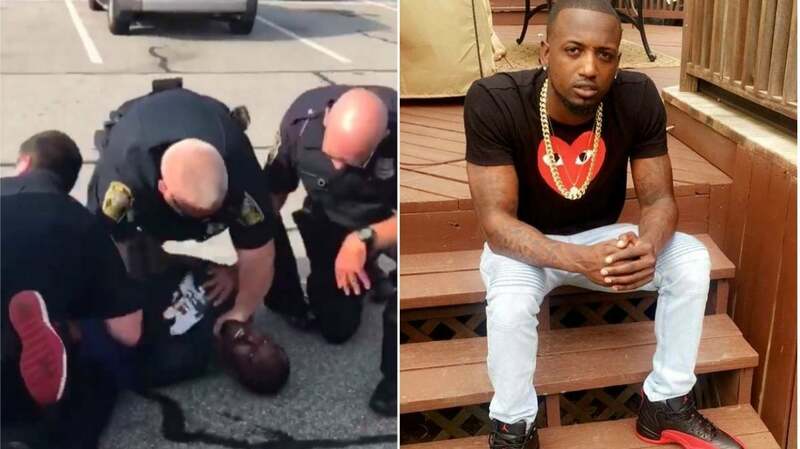 He posted video of the altercation on Facebook along with a lengthy caption explaining that cops arrested him for having a gun, but in fact he only had a cellphone. He also claimed several teeth were knocked out during the arrest. The post also noted how Marrow was initially given no bond, but once police learned he once played pro football AND there was video of his brutal encounter with law enforcement, they offered to drop all charges if he agreed to not post the footage online. Rose appeared in court on battery charges on Tuesday.